Disclaimer: Following are the biggest the longest, the most fun rapids you can find in the sate of Utah. This list is curated by our stellar Guide and blog contributor Justin Malloy and all rankings and opinions are his subjective opinion and his alone. 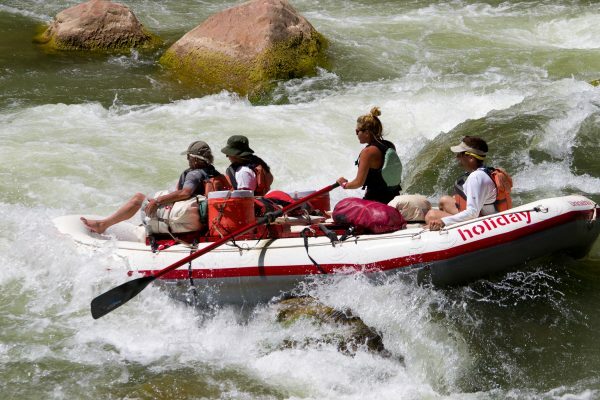 Holiday River Expeditions does not take any official position on the order on inclusion of certain rapids above others. As Dee Holladay would say -choosing a favorite canyon [or rapid] would be like choosing a favorite daughter ,simply impossible!- Enjoy! Cataract Canyon of the Colorado is home to the most whitewater, largest features, and most feared reputation of all of Utah’s rivers, so it is no surprise that a few of its rapids ended up on this list. The rapids here are so great in number and intensity that the first explorers were so overwhelmed, they decided instead of giving each a name, they would simply number them. While the numbers have remained the official names, many have earned more ominous monikers, such as Hell To Pay, Been Hurt, and Satan’s Gut. The first rapid on our list is known as The Big Drop. Technically three separate rapids at low water levels, rapids #21, #22, and #23 at high water form one single, enormous monster that stretches for nearly a mile, with standing waves reaching as high as 30 feet and more destructive features capable of dismantling entire boats. At these water levels, Holiday will use a special rigging system to attach three boats together to gain more stability, and there is no ride quite like it! The Big Drop is named for the fact that it has the steepest gradient on the Colorado River (descending 33 feet over one mile). At lower water levels, Big Drops #1, #2, and #3 are still intimidating Class IV+ rapids that cannot be taken lightly. 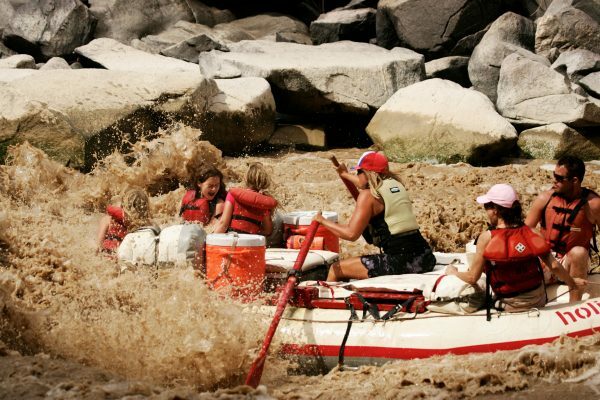 Although the truck-sized boulders that create the signature features of high water are dry and protrude many feet out of the water, the high velocity of the water leaves boatmen little room for error while navigating around said boulders and through the largest waves of the canyon. 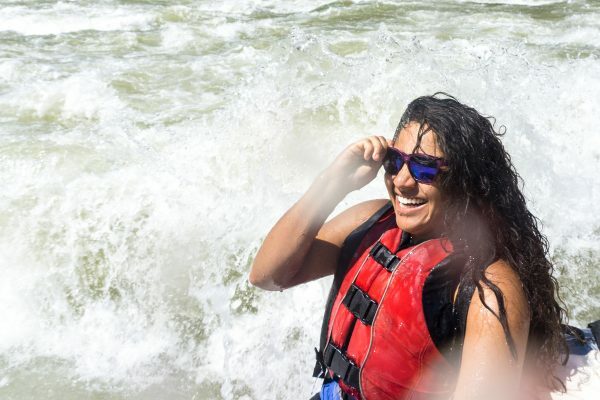 While the Big Drop keeps some guides awake and give others nightmares, there are numerous rapids throughout Cataract that offer nothing but joy and elation. One such rapid happens to come immediately after the Big Drop: #24, known as Powell’s Pocket Watch. 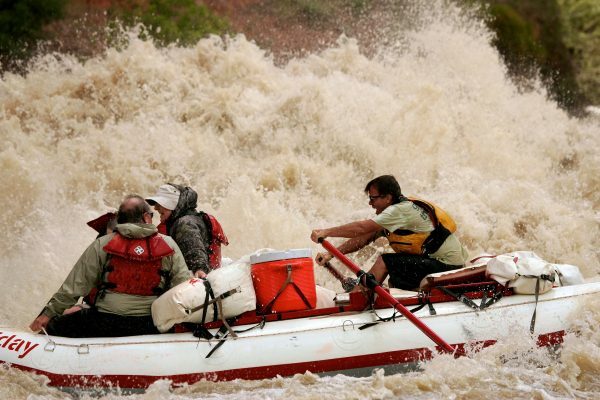 A rollercoaster of waves as tall as your boat is long, coming one after another in quick succession, with few obstacles around to avoid and gorgeous scenery makes this rapid the perfect celebration for surviving the most dangerous part of Cataract Canyon. The construction of the Glen Canyon Dam and creation of Lake Powell drastically altered lower Cataract Canyon, covering many rapids under water and sediment. When I started with Holiday in 2012, the final rapid of Cataract was Imperial Rapid, #27. Immediately after, the current slowed to a standstill and became a lake. Due to low water and high temperatures in the years since, the level of Lake Powell has dropped; therefor the current of the Colorado travels further down canyon and has begun moving the sediment off of the former rapids. On my last trip this previous summer, I counted 35 rapids, seven more than my first trip! 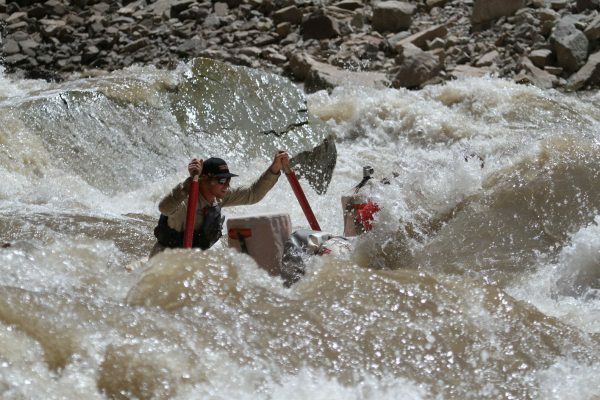 Of these new (or old, depending on how you look at it) rapids, the best is the Chute. The river makes a right-hand bend above the Chute, making it tough to see exactly what you’re in for, and as you round the corner and head into the wave train, it doesn’t look like much… but each wave gets a little bigger until the final one, which if hit at just the right moment can turn any raft into a submarine and drench everyone on board, taking away anything not buckled down as sacrifice to the river gods! The explorer responsible for naming most of the canyons and rapids along the Green River was a man by the name of John W. Powell, formerly a Major during the Civil War who lost an arm in the Battle of Shiloh. He did two scientific expeditions down the Green, the first in 1869 and the second during the winter of 1871-2. 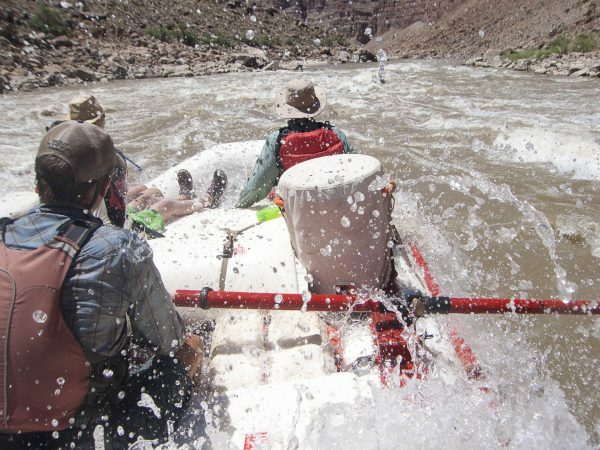 Powell certainly had a penchant for the dramatic when naming the larger rapids they encountered, especially early on in the Canyon of Lodore. The largest rapid here is Hell’s Half Mile. When viewed from shore, the boulders that create this rapid are so large and plentiful that it’s very difficult to see a clear path through. Timing and finesse are key and there is very little room for error, making a perfect run through Hell’s rare… but on those perfect runs, this rapid can splash and excite like no other! And at high water, all of those boulders become submerged and form enormous waves… so make sure to hold on! When Powell’s first expedition attempted Disaster Falls, a boat dubbed “No Name” crashed on a large rock at the top of the rapid, and the men aboard had to swim to shore to survive. After initially deciding to leave the wreck behind, the next morning Powell changed his mind and the men swam back out to retrieve as much as they could (even the whiskey). The boat, however, was lost, and the rapid was so named Disaster Falls. Today, Disaster still gives plenty of boatmen trouble. Making it past “No Name Rock” is just the first step… then one must find the narrow chute below it and navigate the boat through the center. After a nice splash, the middle of the rapid leaves no time to relax as you need to steer away from many tough-to-see rocks and hit as many waves as you can before approaching the bottom of the rapid, which holds the largest waves of the whole ride! Nearly 200 miles downstream from the Canyon of Lodore are the canyons of Desolation and Gray. Although they run concurrently, Desolation and Gray Canyons are distinct in their color, character, and most importantly, age, with nearly 20 million years separating the two rock formations. The point of transition from Desolation to Gray is dramatic, beautiful, and geologically significant, as one can find evidence of the K-T extinction here. The transition is also home to the most fun and splashy rapid of either canyon, named Three Fords. Beginning just after a sharp bend in the river, the first wave of Three Fords greets most riders with a big splash, followed by a rollercoaster of more waves all the way to the end. The river is relatively constricted here, giving even more velocity to the current for a fast and exciting ride! Westwater Canyon, second only to Cataract in terms of whitewater in Utah, could have five or more of its 12 rapids on this list. 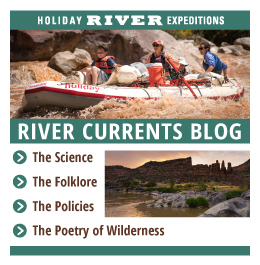 A narrow, black canyon made of steep walls with a billion year old sheen, the river’s current here is fast, violent, and chaotic, with whirlpools and eddy lines unlike anywhere else and rapids that come in quick succession. Given its nature, Westwater was the last canyon of the Colorado to be properly explored. 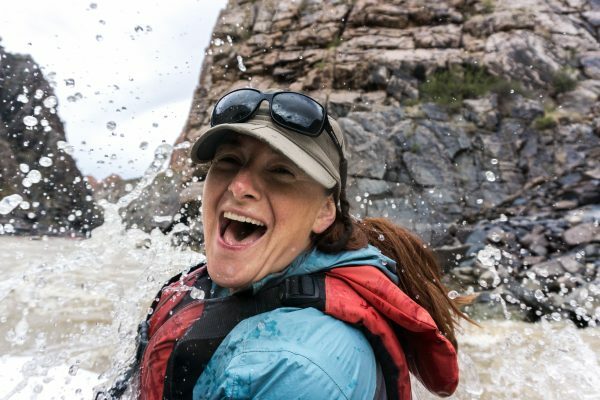 Our founder, Dee Holladay, is credited with naming what is perhaps the most exciting rapid of Westwater Canyon, Sock-It-To-Me. The correct run here is to start left and to row right, directly into the first drop. 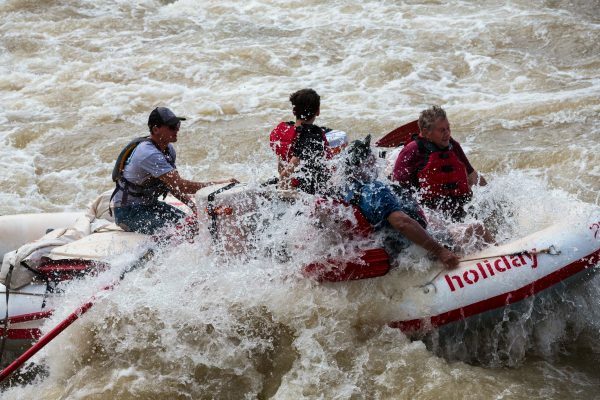 At this point there’s no turning back, and the drop is so steep that it feels as though your boat has been turned up on its nose until it smashes through a huge wall of water, engulfing everyone onboard. Next is a formidable wave train, critical to stay in control of because immediately after, a large rock (known as the “Rock of Shock”) juts out from the left wall and has been known to cause some unexpected excitement. 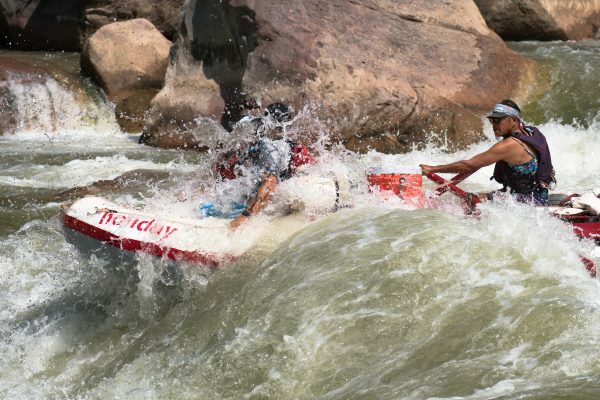 The shortest rapid on the list in terms of length, Funnel Falls is the fourth rapid in Westwater Canyon. 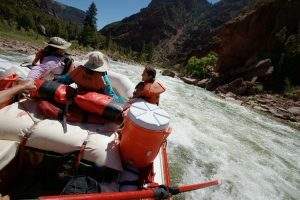 Even from a boat on the water, its easy to see how this rapid got its name: the current here flows directly over of a large boulder, causing a steep drop and a sharp turn, like water down a funnel. If after the drop your boatman is able to avoid the “Magnetic Wall”, you will be rewarded with three fun, splashy waves and a short reprieve until its time to hold on for the next rapid! A contemporary monster, the story of Warm Springs is unlike any other. It lies directly in the middle of a four-mile stretch of the Yampa River that, historically, was flat and benign, until a fateful night in June of 1965 when rains of biblical proportions fell and caused Warm Springs Canyon to flash flood. Evidence shows the river was temporarily dammed to a mere trickle due to the spontaneous constriction of boulders and earth from the flood, until the Yampa built up enough force to blow through. The following day, two groups (Dee’s party being the second) successfully ran the new rapid before the Park Service closed the section due to the danger. Over the next few days, the river resettled, and Warm Springs Rapid was born. From shore, the power and force of its creation is still palpable. Thunderous holes with innocuous names like “Marmalade” and “Steve’s” roar at you to stay away. Another feature, “Maytag”, silently beckons all rafts to it with promise of a long spin cycle. To successfully navigate through Warm Springs requires one to stay calm and focus on the timing of their maneuvers… a difficult task, given the chaos happening all around. Through all of this excitement are plenty of splashes, and getting to the other end of the rapid upright will make you feel reborn! With so much amazing whitewater around Utah, it was tough to narrow this list down to the “Top 10”. There are many great, exciting rapids that haven’t been mentioned. 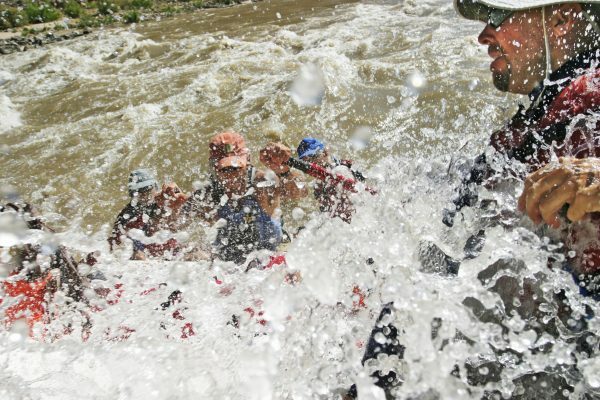 When I tried to decide on the final rapid for this list, I imagined which one that could be recognized as the most objectively FUN, and the answer was clear: Stateline Rapid on the Green River (at high water). Named as such because it lies directly on the Colorado-Utah state line, the river here becomes very narrow, which causes what’s known as “constriction waves”. These waves don’t break, so instead of causing splashes, boats instead ride up and down them like a rollercoaster. At high water, Stateline becomes a thrill ride for everyone, with no obstacles to avoid and the simple task of holding on and having fun! 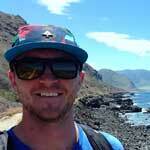 Originally from the suburbs near Cleveland, Ohio, Justin made his way to Utah after graduating from Ohio University with a degree in exploring and having fun… If not on the river or in the kitchen, you’ll find him wandering the mountains, drinking coffee, or writing down words he hopes will come across as sensical.